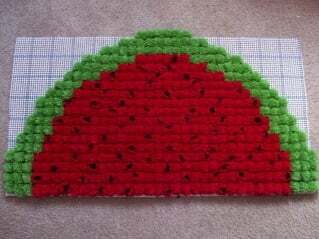 This is a sturdy pom pom rug in the shape of a watermelon slice. It will look good in just about any kitchen, or at the front door to welcome your visitors. 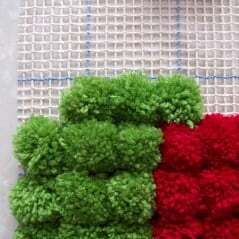 It is made by attaching your pom poms unto a rug canvas for a nice sturdy mat. Red Heart Comfort Sport yarn, or other worsted weight yarn, in colors of green (about 250g), red (about 600g), and black (about 40g). You can make your pom poms around 2 of your fingers. However, to make it easier, I used the small end of a POM POM MAGIC, which is about the same size as 2 fingers. 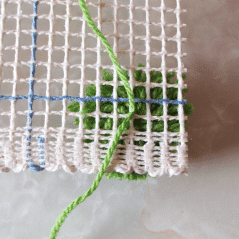 If you do not know how to make pom poms, click here for a tutorial. The tutorial does not specify how many wraps you should do for each pom pom, but 60 to 70 wraps should be enough to get nice full pom poms. About 74 Red and Black Pom Poms (these are the watermelon seeds which you will mix in with the red pom poms roughly about every third to fourth pom pom, as it seems right to you). The solid red, and red and black pom poms should come to a total of 324. 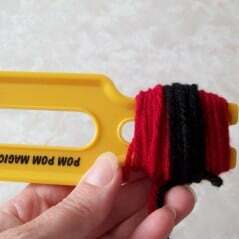 To make the red and black pom poms, simply wrap the red yarn around the pom pom maker about 60 times, and then do about 5 to 7 wraps of the black yarn. Continue as you would with the other pom poms. 1.) 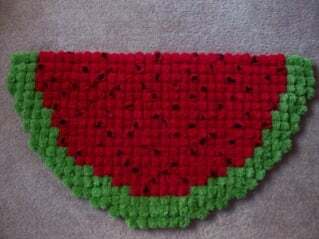 The pattern is worked in horizontal rows, with the 36″ side facing you. 6.) When the pattern does not state to indent, then attach your first pom pom directly over the first pom pom of the previous row. 7.) The pom poms are secured with a double knot on the wrong side of the canvas. 9.) The pattern does not specify where to place your red and black pom poms. Thus when it says to do x number of red pom poms in a row, it is up to you to decide where to place your red and black pom poms, as they are included in this number. 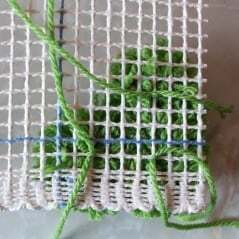 Row 1: With the 36″ inch side facing you, attach your first green pom pom about 3 to 4 threads into the canvas as pictured below. 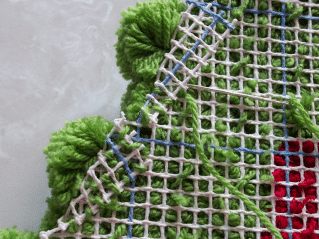 Attach another 2 green pom poms, then attach 28 red pom poms, and another 3 green. 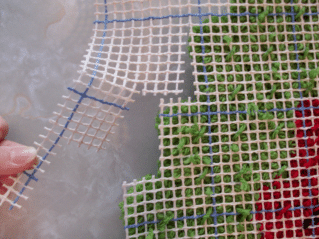 Rows 2-4: The rows are done in the same manner as row 1, with 3 green, then 28 red, and another 3 green. Row 5: Indent 1 vertical row. Attach 3 green, 26 red, and another 3 green. Row 6: Attach 3 green, 26 red, and another 3 green. Row 7: Indent 1 vertical row. Attach 3 green, 24 red, and another 3 green. Row 8: Attach 3 green, 24 red, and another 3 green. Row 9: Indent 1 vertical row. Attach 3 green, 22 red, and another 3 green. Row 10: Attach 3 green, 22 red, and another 3 green. Row 11: Indent 1 vertical row. Attach 3 green, 20 red, and another 3 green. Row 12: Indent 1 vertical row. Attach 3 green, 18 red, and another 3 green. Row 13: Indent 1 vertical row. Attach 4 green, 14 red, and another 4 green. Row 14: Indent 1 vertical row. Attach 5 green, 10 red, and another 5 green. Row 15: Indent 1 vertical row. Attach 6 green, 6 red, and another 6 green. Row 16: Indent 2 vertical rows. Attach 14 green pom poms. Row 17: Indent 2 vertical rows. Attach 10 green pom poms. Row 18: Indent 2 vertical rows. Attach 6 green pom poms. 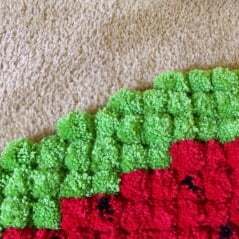 When all your ends are pulled through and trimmed, you can continue with the edging. 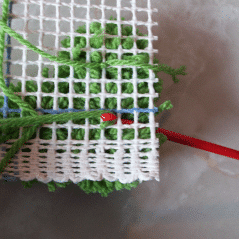 Cut around your rug leaving approximately 3 to 4 threads for you to fold over and secure with yarn or strong thread.